In a research project aimed at developing an objective index to identify autism in patients, subjects were recorded with Tobii Pro eye trackers while viewing video clips. By analyzing gaze patterns, researchers developed a quantitative method to help diagnose autism. The prevalence of autism, a developmental disorder characterized by impairments in social interaction and communication, has increased tenfold in the last 30 years. The diagnosis depends on correct judgments as to whether each symptom listed in the diagnostic criteria is met or not. This means an accurate diagnosis of autism calls for an expert in the field, but there are too few of these to meet the increasing needs of the population. Consequently, there is a demand for a system that can be used by non-experts with an accuracy comparable to that of someone trained in this disorder. Gaze analysis can be used as an autism diagnosis system. In recent years, unobtrusive eye tracking systems without a chin rest or headgear have become increasingly accurate. This new technology has made eye tracking infants and young children as easy as testing adult participants. 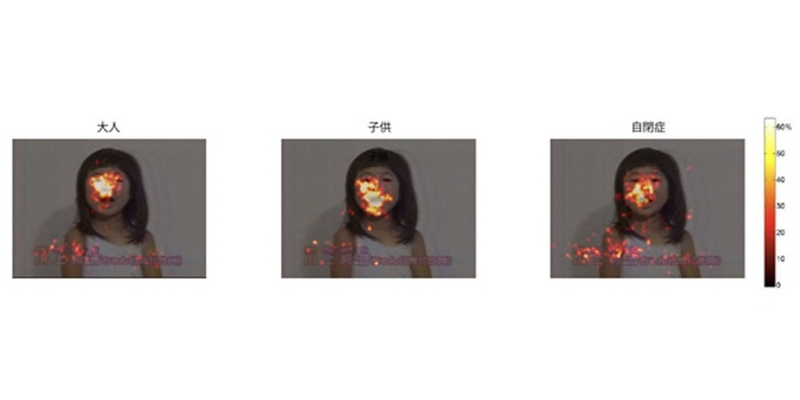 The objective for the researchers at Osaka University was to develop a quantitative scale for identifying individuals with autism based on gaze measurement data that could be applied to adults, as well as children. "By using eye tracking, even a non-expert is able to draw ample information from non-verbal children. The method has a wide range of applications such as screening of developmental disorders in children." The team at the Graduate School of Frontier Biosciences at Osaka University in Japan examined 25 young children (average age of 3) with autism, 25 age-matched children with typical development (also known as TD or neurotypical children), 27 adults with autism, and 27 neurotypical adults. The individuals viewed the same brief video clips taken from films and TV programs for young children. The video stimulus featured several characters talking, with varying degrees of social context and distracters in each scene. Gaze positions of both eyes were measured with a Tobii X50 screen-based eye tracker. The researchers then analyzed the gaze patterns for all of the participants, focusing on the subjects' attention to eyes and mouths during the video clips. One well-known observation in past research is that adults with autism look more at the mouth of a person than the eyes. However, when studying children with autism, these observations were not consistent. The research team decided to start by investigating this hypothesis. The theory appeared to be true for adults. The neurotypical group spent more time looking at the eyes than the participants with autism did. However, results pointed to the opposite conclusion in the child group, with neurotypical children looking more at the mouth than the children with autism. Comparing the data from children and adults, frame by frame, it became evident that the difference became most apparent when a character started talking. While the neurotypical adults generally looked at the character's eyes (left), most TD children instead paid attention to the mouth (middle). During the course of verbal development, there might be a certain period when human voice is associated with mouth movements. As the child accumulates a certain amount of experience, they eventually concentrate on the eyes of the speaker for complete communication. Assuming the change of focus from the mouth to the eyes comes with development, it would be impossible to develop an index of social disorders applicable to all ages based on this ratio of eye/mouth viewing time. The research team then decided to construct an index using all of the available gaze data from the Tobii eye tracker. Taking all of the subjects' gaze patterns into account, the team summarized the data by using multidimensional scaling (MDS). If the temporospatial gaze trajectories are similar in a pair of subjects, they would be plotted very near to each other. Thus, a group of subjects with a similar gaze behavior would form a cluster, and those with atypical gaze behaviors would be plotted in the periphery, far from the others. 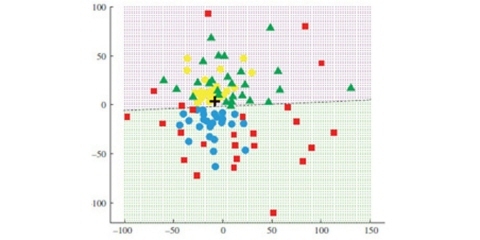 When the data was plotted in this way, most neurotypical control group participants were distributed near the center, while the participants with autism were distributed along the periphery (see the plot in the top right figure; the '+' mark in the center of the plot indicates the median, which can be thought of as corresponding to the most neurotypical way of looking at the video stimulus). The distance from the 'center' (MDS distance) was thus smaller in the neurotypical groups than in the participants with autism. The results show that neurotypical control groups share similar gaze patterns, whereas those with autism show atypical gaze behaviors that differ from one subject to another. The distance from the 'center' of the MDS plane, which reflected the degree of deviation from the standard temporo-spatial gaze pattern, efficiently distinguished control participants from those with autism in both children (87%) and adults (75%). The team expects that this distance could be used as an effective scale of social impairments in autism that can be applied not only to adults but also to children. The research team also applied the same method to the participants with specific language impairment (SLI) who had delayed verbal development, but no social impairments. On the MDS plane, it was possible to distinguish the individuals with SLI from the control group with 80% accuracy. Using the distance from the MDS median, it was also possible to distinguish the group with SLI from the autistic participants to the same level of accuracy. Finally, comparing the participants with SLI to the neurotypical control group, it became clear that the subjects with SLI looked at the mouth more than neurotypical subjects did. A wealth of information can be found from analyzing the gaze patterns of individuals watching the video stimulus mentioned in this research. By extracting this information, a simple yet effective method for detection could be created. In the future, the same method could be used to evaluate the outcomes of treatment methods like applied behavior analysis. 1. Nakano, T. et al. Atypical gaze patterns in children and adults with autism spectrum disorders dissociated from developmental changes in gaze behaviour. Proc R Soc B277, 2935-43 (2010). 2. Hosozawa, M., Tanaka, K., Shimizu, T., Nakano, T. & Kitazawa, S. How Children With Specific Language Impairment View Social Situations: An Eye Tracking Study.Pediatrics129, e1453-e1460 (2012).